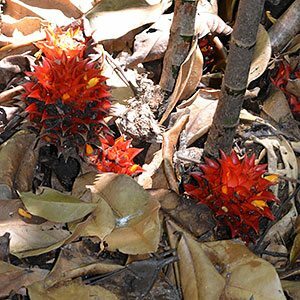 This is a ginger that has basal flowers, Tapeinochilos brassii does have tall bamboo like stems, however the flowers appear at ground level. The plant itself will reach around 1metre in height it can reach over 2 metres in height with more light, and will form a clump over time. Originally from Papua New Guinea, this is an understory plant and grows well in tropical to sub tropical rainforest areas. The flowers appear in spring and are a bright red to orange colour. Best grown in tropical to sub tropical climates, although it can be grown in cooler climates if a suitable warm microclimate is established. Position – Best grown in dappled shade as an understory plant. It is easiest to propagate Tapeinochilos brassii by division of established clumps. It can be propagated from seed, however they are difficult to find and will require a heated propagation bed in most areas. The brilliant red flowering Tapeinochilos ananassae, from far north Queensland and Papua New Guinea. Tapeinochilos recurvatum – Pink to red flowers. Green and yellow flowers in summer are a feature of Tapeinochilos densum – A large growing variety that handles more sun than most.